Should Parents Help Pay for Their Children's College Education? 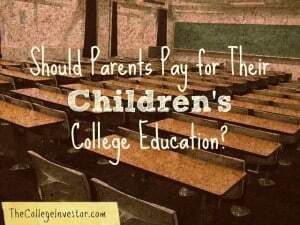 Home » Should Parents Pay for Their Children’s College Education? As a kid you think that your parents have been socking money away for your future college education. Then you grow up. And chances are that magical fund that you thought existed, doesn’t. When you head off to college you really aren’t worried about things like student loans. You don’t even grasp what debt can really do to you. You just go with the flow and take out as much as money as you can in order to pay for school. In fact, it’s incredibly easy to get a student loan you might not even think much of it. After a couple years you smarten up and realize how much debt you’re now buried in. And you wish your parents would have helped you cover the cost of your education. Or, do you? The average student loan debt for the class of 2016 was $37,172. And that’s just the average. Many students have found themselves buried in a much, much larger amount of debt. As a result, the average net worth of millennials is negative! As a parent, the thought of my daughters starting their young adult lives out with that much debt is scary. I want to do everything I can to help! Just as there are advantages, there are also disadvantages to parents paying for their children’s educations. And each parent has to make their own decision when it comes to paying for college. I’ve got to admit I’ve always felt that kids should bear the burden of paying for their own education, until I had kids, that is. However, financially, it typically does make the most sense for students to pay for their education (not parents). While student loan debt is a burden, at least students can get loans. As a parent, you can’t get a loan for retirement – so if you blow all your savings (or even worse, take out Parent PLUS loans), you could be struggling to retire. You could even become the financial burden on your children you were trying to avoid. Furthermore, I’ve seen so many friends and family members change majors three or four different times, take a minimal amount of courses each semester, and act so self-entitled when their parents pay for their education. Then I talk to someone or read a story of student who’s paid her own way through college, excelled academically, and come out on top. And I think that’s the way to go. And I think if a student’s willing to put in the work she can find creative ways to help minimize the amount of student debt she needs to take out. There are huge advantages to both helping pay for a student’s education and letting college students fend for themselves. Perhaps, the better solution is to meet somewhere in the middle. We’re huge advocates of financial balance with pretty much every financial decision. This decision doesn’t have to be “either/or”. It can be “and” – meaning that you can help pay for some college (maybe a set amount each year), and the student pays the rest. There’s no one size fits all here. But by teaching children money management at a young age, parents can prepare their children to make smart decisions – like only taking out student loans for education rather than financing their lifestyle. And parents can still pitch in to cover the cost of education and leave a smaller portion for their college aged kids to pay. It’s important to remember though: if parents don’t have the capabilities to help their children financially, they shouldn’t. But parents should have open and honest discussions with their student early on, so that there are clear expectations come senior year of high school. I’ve always steered in the direction that it was best that parent’s do not help pay their children’s education. I’ve had to take care of myself starting at a pretty young age and I think I’m a better person because of that. At the same time, I now have two young children. I want them to succeed. I want them to get an education and I don’t want them to start their young adult lives buried in debt. Which is why I’m thinking meeting in the middle is a better choice. What do you think? Should parents pay for their children’s college educations? I recently wrote about this, and think that it really depends on the situation of the family. Ultimately, if you could do both, that would be great. Education (in my view) is more important than ever, and it’s also more of a problem for people to have onerous student loan debt. To the extent a parent can give his/her child a solid start in life with a good education and little debt, that seems ideal. That being said, I also think that the bottom line is that we can’t borrow for retirement, so those needs should be the top priority. You’re right about the balance. I think that ROI on the education needs to be considered as well. If the ROI is there, the parents should be more incentivized to help. If the parents can afford their child’s tuition fee, then for me it’s better if they would pay the tuition fee. My sister who is a first year nursing, she is a half scholar and we only pay the miscellaneous fees. Agreed – if they can easily afford it, I don’t think there is harm in paying it. I wish my parents would have paid my college tuition, but paying for it myself has taught me an amazing work ethic and understanding of money I don’t know if I’d have otherwise. Putting most of the burden on students helps students be creative and flexible. Also as someone who pays for most of his way through school modest federal loans and working I have so much appreciation for the education. I appreciate all the struggles and hard-work it took for me to be able to attend a top-notch school. It makes the experience more personal and important to the student because I have a lot invested in the process. My parents and grandparents were multi-millionaires. My mother was deceased and my father remarried. My grandmother was widowed. Not one of them lifted a finger to help me. After putting myself through two years of pre-med and earning an A- average in all the core sciences and math through calculus, they still wouldn’t help. I was exhausted and in what I thought at the time was a lot of debt. I gave up any hope of going to medical school or graduate school at all for that matter. If parents are able and a student is motivated and in a demanding program. parents should pay the full expense. If your child wants to study art or philosophy, let them pay for half and take their time until they realize they have learn a marketable skill. In short, look at it case-be-case. We paid for everything when our three children went to college. The two older ones are successful in their careers. The youngest is a homemaker. I haven’t regretted a single penny. Multimillionaires and didn’t lift a finger? I find that rather sad & heartless. Yes, Yes, YES! I’m a millennial and this is what I have learned. I will never think twice about having a child unless I can afford to provide him/her my time, my love, a quality education, college funding from age 0. It is becoming ever more important to ensure that your child has every possible advantage necessary to succeed in this very competitive world. Long gone are the days of ole, where you could just get by being average. The world no longer wants average, it demands EXEMPLARY and nothing less. If you don’t have the resources, time, or interest in setting up your child for greatness. Please for their sake, do not have any. I find your comment to be cold and heartless. A parent should provide for their children’s education, food, housing and medical care until they are eighteen, and love for the rest of their lives. To say that all children whose parents won’t or can’t do more than that shouldn’t be allowed to exist is incredibly cruel. In fact, to say that a child whose parents don’t even provide the basics I’ve mentioned doesn’t deserve to live is terrible also. People can rise above their circumstances…they should be given the opportunity to choose for themselves.